Review of Enlightenment Now: The Case for Reason, Science, Humanism, and Progress (Viking, 2018). Steven Pinker’s Enlightenment Now is a manual for liberal self-congratulation. This preening tome professes a pragmatic and quantitative approach to the world’s problems. For Pinker, modern capitalist democracy has basically gotten things right, and activism should at most consist of pushing for minor improvements, mitigating bad symptoms around the edges. Systemic critique, ideologies, and “big ideas” are downright dangerous. Criticism of liberal capitalism is thus the provenance of hysterical populists on both the Left and the Right. What “Marxist professors” and racist Trump supporters have in common is that they just don’t know (or want to admit) how good they have it. 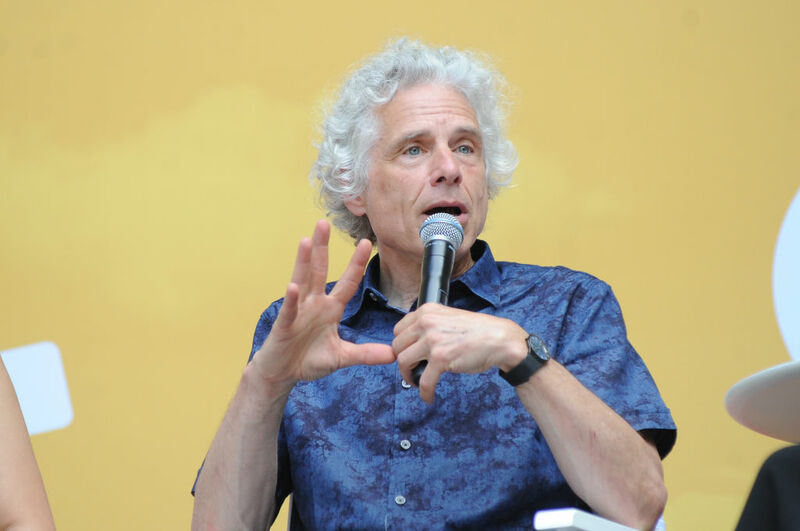 Pinker is passionate in his tepidity, and contemptuous of anyone daring to criticize the present world order. Superficially, Enlightenment Now is compelling to the fair-minded reader, as it is chock full of statistics and graphs ostensibly demonstrating the march of progress since the Age of Reason. Liberals will applaud Pinker’s frequent praise of social programs and the welfare state as necessary supplements to the “free market.” At the same time, reading Pinker gives one a subtle but persistent feeling of nausea that surfaces every time he excoriates “social justice warriors” or cites capitalist fundamentalists like Friedrich von Hayek. The Enlightenment is shorn of its most egalitarian and democratic elements — it no longer resembles the intellectual ferment of the French Revolution. Instead, Pinker’s “Enlightenment” mimics the hierarchy, conservatism, and authoritarianism of the ancien régime — that historical enemy of Radical Enlightenment. But this muddying of the ideological waters is part of Pinker’s deliberate strategy. Even when he covers historical figures, he makes a point of throwing together radical rationalists like Baruch Spinoza alongside classical conservatives like Edmund Burke. The ideologies of these figures are thus blunted, confused, and made absolutely malleable in his hands. Pinker does not so much celebrate Enlightenment Reason as repackage it for his neoliberal agenda. He limits reason to make room for the market. What Pinker valorizes is the heroic creation of businesses, markets, ideas, and information as against a universe that tends towards blandness, sameness, and “uninteresting” monotony. These creative-types are valuable precisely in their struggle against a world which is hostile, or at least indifferent, to human needs and flourishing. This is the sense in which Pinker is, surprisingly to most, a sort of pessimist. It is human effort and will that must create their own salvation against the dire backdrop of cosmic meaninglessness. Pinker is a cheerleader for science and technology. He opposes the irrationalism of the eco-pessimist, and their desire to prostrate themselves before Gaia. Pinker’s fundamental, guiding principle is that of “entropy.” Borrowed from the second law of thermodynamics, entropy is the idea that in closed systems things become less ordered and more chaotic over time. Human organization and culture are thus a Sisyphean battle, where human effort hits up against the unyielding gravity of existence. Here, the values are inverted, and instead of bemoaning that people are killing Mother Earth, Earth is trying desperately to kill us. He means this in a deep way — not a fear of the Earth’s ecosystem, but a metaphysical dread of the universe itself. A cognitive psychologist, Pinker is fond of importing scientific concepts in order to bolster his political arguments. In this case, Pinker employs an accepted law of physics and proceeds to wildly elevate it to a metaphysical first principle — and, more bizarrely, makes it the cornerstone of his politics. Not only are closed, physical systems entropic, but so is existence itself, including the human condition. In Pinker’s estimation, Being-as-such tends toward chaos and disorder. His view of the universe is no less “fallen” than that of the most disenchanted existentialist or religious penitent. The result of all this is that human endeavor must be conceived as essentially “heroic.” We are always fighting against the encroaching night of a hostile universe. “Enlightenment” is thus almost a literal word for Pinker, and is equated with the search for (or creation of) information. That this is indeed Pinker’s viewpoint is demonstrated by his statements on poverty, war, and human ignorance. For example, Pinker maintains that poverty needs no explanation at all. It is the natural (entropic) state of things. We are born poor, dumb, and violent, and it is only through great effort — effort that runs against the grain of nature itself — that we can hope, however tentatively, to emerge from this fallen first position. Politically, this has pernicious implications. Pinker, for instance, is quite explicit that we needn’t blame anyone for the inequality that marks our economic and financial lives. Again, it’s merely “natural.” Neither should we aim for equality as a primary good. Pinker’s law of entropy, after all, identifies absolute equality with a sort of “heat death” in which variation and interesting organization evens out into a gray, bland, nothingness. Pinker is eager to explain why he thinks that inequality is not harmful in itself, but rather an occasional cause of subjective unhappiness at worst. In any case, his political program is clear: Marxism, socialism, and indeed any form of egalitarianism are ultimately equated with the heat-death of society, and so these count as existential threats to civilization. For all of Pinker’s assertion that “ideas matter,” he also thinks it far better that such socially conscious activists just shut up. After all, in his view, the irresistible tide of market-driven progress will expand social investment, increase literacy, and eliminate homophobia, racism, and sexism automatically. Never mind the pivotal role played by such “infantile SJW initiatives” as the Civil Rights Movement, feminist movements, anti-apartheid struggles, and campaigns for workers’ rights. Pinker’s resistance to thinking about “root causes” is essential to his anti-Marxism. Central to Marxist economics is the insight that inequality is not the result of maldistribution of wealth, but rather occurs at the point of production. It is the very fact of making things for a profit that requires workers to be underpaid for their labor — otherwise, there would be no profit to be had for the capitalist. This situation is what breeds massive stratification and inequality today. There are the exploiters and the exploited — those who extract the labor of others for profit, and those who own no capital themselves, and so must sell their labor for less than it’s worth. So it is not a question of rich versus poor (the “symptom”) so much as a fundamental question of exploitation itself (the “root cause”). Pinker will have none of this. Stubborn in his belief that we are all just individuals, he derides class consciousness as just another form of tribalism, no different from ethnic, racial, or religious chauvinism. Allegiance to the proletariat is simply a form of bad faith, where a person resigns their individuality to become part of what he calls a “superorganism.” This is to echo Margaret Thatcher’s dictum that “there’s no such thing as society.” Despite eschewing libertarian excesses, Pinker follows the Austrian School of Economics’ criticism of socialism faithfully. Pinker wants to see the world as it really is, apart from any meta-narratives or grand ideologies. But from the beginning, this is a doomed project. Humans are not optical scanners that passively take in isolated data points; we necessarily narrate our perceptions into some intelligible worldview. So the question is not whether to do metaphysics — to develop some narrative to explain the world — but only whether our metaphysics is any good, and can be sufficiently argued for. While criticizing Big Ideas, Pinker’s work is nonetheless shot through with a number of a priori assumptions of his own. “Fallenness” and “Heroism” are interlocking mystical principles that cannot be derived from quantitative analysis. The best we can do, according to Pinker, is to put our blind faith into the equally blind mechanisms of the marketplace; for they determine, better than the human intellect ever could, the proper price of things, what sort of labor is valuable, what sort of education is necessary, and what sorts of commodities should be produced, and for whom. This faith in exchange mechanisms is supplemented by an equally blind faith in elites. For in Pinker’s mythology, the market does not work entirely on its own, but must be constantly revitalized by any number of creative gods. Without the sparks of genius from a Peter Thiel or an Elon Musk, exchange could not occur because no value would be created. Value, here, is not the product of common effort, but rather individual inspiration, vision, and will. It’s telling that a Nietzschean conservative like Peterson would have such an easy time praising a seemingly wishy-washy, quant-liberal like Pinker. What they share is a fundamental rejection of activist politics and the worldview of resentment that they see underwriting it. What they share too is high praise for humility, and a constant invocation of human limits — both epistemic and moral. But this odd bromance is more than a one-off peculiarity. It is indicative of a long-standing tendency of liberals and authoritarian reactionaries to embrace one another in times of political upheaval. Pinker voices the standard liberal reservations about Peterson, especially his faith-based philosophy and anti-humanism. At the same time, he is quick to defend Peterson against critics on the Left. What they share is a primal fear, not of elitist hierarchy, but instead of rabid populism from below. To stave off this zombie apocalypse, Pinker — and many other centrist liberals — will be willing to reach across the aisle and form alliances with the right wing. “Bipartisanship,” and a valorization of individualism and humility, are made the enemies of mass democratic politics. Landon Frim is assistant professor of philosophy at St. Joseph’s College-New York.